Ever thought about donating yourself to science? Now you can! Diving enthusiasts are urgently needed to help monitor the world’s largest type of manta ray (manta birostris) in the Great Barrier Reef off Lady Elliot Island. Mantas are the gentle giants of the ocean, weighing as much as 1,400kg and with a disc width of up to seven metres. To witness these magnificent creatures in their natural environment is a real privilege. Mantas are slow to reach sexual maturity and females give birth to just one pup at a time making them vulnerable to global fishing pressures. An alarmingly rapid emerging market for manta ray gill rakers in Chinese medicine is now also threatening global populations of giant manta rays. This pressure has caused a rapid decline in the numbers of manta rays and unfortunately, the giant manta is now listed as vulnerable on the IUCN Red List for Threatened Species. In Australia, the species is found in both tropical and temperate waters, with Lady Elliot being a known hotspot for manta interactions during the summer months. They occur in relatively shallow waters along the East Coast from Narooma in Southern New South Wales, to the tip of Cape York, a distance of almost 4,000 km. Amid increasing global efforts to curb decline, the Australian Federal Government recently offered some protection to the species in Australian waters under National Environment Law. However, mantas are a highly migratory species so protection in Australian waters is only part of the answer. Little is known about most aspects of manta biology, ecology and for the Australian population, virtually no data is available on where they migrate. 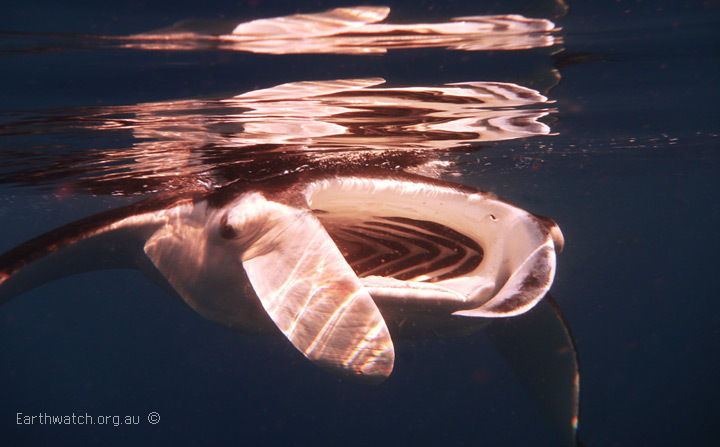 More data is needed in order to better protect our magnificent mantas. Internationally renowned Marine Scientist and Project Manta Expedition Leader, Dr Kathy Townsend quotes: ”Earthwatch via Project Manta is rectifying this disturbing lack of information by engaging scientists, industry partners, and the general public in a comprehensive study of Manta Rays that will enhance our knowledge of the species, generate economic and social benefits, and provide a basis for long-term monitoring of the environment.” Now is YOUR chance to help in this vital research. Organised through Earthwatch, the first Project Manta team kicks off on 11 February 2013 and runs through until 18 February. Cost to join is $2,700 and includes all food, accommodation, diving, flights from Hervey Bay to Lady Elliot Island and a contribution to the research so that it can continue. Earthwatch require that all divers have a minimum of Open Water diving certificate and at least 30 logged dives (with one in the last six months). To sign up for the expedition call Earthwatch on 03 9016 7590 or visit earthwatch.org.au. Also check out and “like” the Project Manta Facebook page for regular updates. I would love to help with this project, but $2700 for someone to volunteer for one week seems very steep =(. ← Nitrogen narcosis ...it's a state of mind!